Denon's first foray into the increasingly-crowded soundbar arena, the X-Space DHT-FS3, is at least a stylish entrant, with a piano black finish and curved main speaker unit that is considerably more slender than rival models we've seen from Philips and Yamaha. Installation is a simple case of plug and play. Well, almost. Room and positioning options are available via the setup menu, accessed from the supplied remote control. There's no onscreen display here, though - menu options and settings are shown on the soundbar's front panel. Behind the front grille are six 8cm speaker drivers, each powered by a digital amplifier. Denon's X-Space Surround technology purports to create an expansive soundstage by beaming surround effects over a broad area, and employing psycho-acoustic processing trickery. Unlike Yamaha's market-leading YSP sound projectors, it doesn't rely on room reflections to envelope the listening area. As part of the £700 package you get a compact 6.5in-driver subwoofer, which matches the aesethics of the main unit. The market for single-box, pseudo-surround solutions is growing rapidly. And in this world of high-tech compromise, the Denon performs well enough. Onboard processing creates an expansive and atmospheric sense of space. Surround effects creep down the sidewalls. Centre dialogue is clean and anchored to the TV screen. Mid-bass is conveyed by the directional mini-sub, which is limited by its 40W amplifier. Music playback is pleasing enough. Switched to stereo mode, the system performs like a decent all-in-one. It remains to be seen if this is a me-too proposition or the beginning of a genuine product line for Denon, but overall it works well. 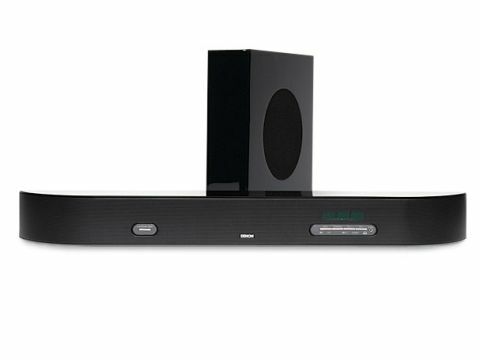 It faces stiff competition from Yamaha's superior YSP 1100, but anyone in the market for a one-box speaker solution should give it an audition.